When you are in the market for a new car, our staff at Grand Blanc Motorcars can help you understand what features come with the vehicles that you have in mind, which can help you make an informed purchase. Many new vehicles come with active safety features that enhance protection. One top safety feature is a Blind Spot Monitor. A Blind Spot Monitor works by using sensors to detect for when a vehicle moves into your blind spot zones. 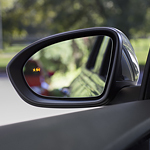 If one is detected, you will be warned with a visual alert that typically appears on the side mirrors. There are some Blind Spot Monitors that also warn you with an audible chime. Blind Spot Monitors are a popular choice with our consumers because they can reduce the chance of a lane-change collision. About 9% of new vehicles are equipped with a Blind Spot Monitor as a standard safety feature, and 57% of newer models offer a Blind Spot Monitor as an available safety feature.